If you couldn’t tell by now, No Man’s Sky is not the game a lot of people wanted it to be. But what is that game, exactly? I think we’ve all, at some point or another, wished for The Ultimate Video Game. The idea of a game that caters to everyone with a deft mix of endless breadth, countless play styles, and an intangible glue binding it all together is irresistible. Even before games were technologically sophisticated enough to achieve the idea, sci-fi works like Snow Crash were imagining such a game, such a world. It’s no wonder that a handful of developers are trying to make that game. They always have been. Before the modern crop of Star Citizens, it was everything from Spore to Dwarf Fortress. Before that, it was early MMOs like Ultima Online, or sprawling single-player games like The Elder Scrolls II. Before that, it was the biggest Multi-User Dungeons (MUDs). How exciting would it be if somebody pulled it off? It becomes a problem, however, when that hypothetical, still impossible game becomes the standard by which many existent games are judged. Let’s get this out of the way upfront: I have no problem with people who are disappointed by No Man’s Sky. While not all of their expectations are reasonable, Hello Games absolutely claimed some major features would be in the game, and they failed to deliver. I personally enjoy it as a kind of psychedelic outer-space tourism game—more about looking than touching—but there are glaring faction, multiplayer, and snake-monster-shaped holes in its procedural fabric. It’s only natural to feel let down by that. But some of people’s grander dreams of the perfect No Man’s Sky—the Platonic ideal; No Man’s Chair, if you will—aren’t really true to what the game was ever about. I’ve seen gobs of people collectively assembling an imaginary No Man’s Sky that’s more Star Citizen meets Minecraft 2 than Sean Murray’s beard-born fever dream. Large-scale multiplayer, full destructibility, base-building, farming, livestock-rearing, war, peace, romance, player-driven economies, a pristine egg at the center of the universe containing an infinite number of snake monsters, each eating their own tails. They wanted The Ultimate Video Game. Hello Games promised something big, but I’m not sure they ever promised that. Just because a space game is ambitious, that doesn’t mean it’s gonna be the same space game as the other space games, except bigger and more ultimate. I think, however, that some people conflated those ideas. Because No Man’s Sky doesn’t have features that other, markedly different space games tout, those features are somehow “missing.” It lacks core pieces of The Ultimate Video Game. That’s a slippery slope, one that confines multiple games with different goals in a packed cage. Steam survival games are perhaps an even bigger influence on the No Man’s Sky ire tire fire than the recent explosion of hyper-ambitious space games. Again, in broader strokes, No Man’s Sky sounds quite similar to them. Procedural generation? Check. Survival mechanics? Check. Some form of multiplayer? Check. I’ve seen countless threads arguing that, because No Man’s Sky didn’t use those extremely particular games as its launching point, it Fucked Up Big Time. “Why isn’t No Man’s Sky a base-building playground power fantasy? It needs to be an evolution of DayZ, Rust, and Ark: Survival Evolved, or else it’s not A Good Game.” That kind of thing. Steam survival games are perhaps an even bigger influence on the No Man’s Sky ire tire fire than the recent explosion of hyper-ambitious space games. And I get why some players viewed No Man’s Sky as an extension of those games. The modern survival genre is more modular than just about any I can think of. It was born of modularity, of developers seeing games like Minecraft and DayZ and going, “OK, I’m gonna do that, except with features X, Y, and Z.” More, more, more. Each game aiming to be bigger than the last. Once again, we find a genre that many hope will evolve into The Ultimate Video Game, a hope bolstered by the fact that survival mechanics have started creeping into countless other genres. 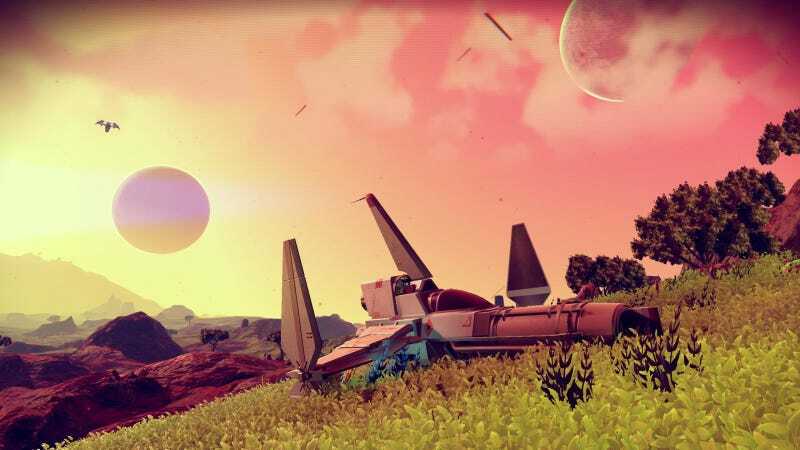 Many trademark multiplayer survival game mechanics, however, would be directly at odds with No Man’s Sky’s emphasis on placid exploration and admiration of your surroundings. Sure, building bases and going to war with your pals would mean more Stuff to do, but it’d be the same stuff you can already do in countless others games. What’s the point of that huge backdrop if everybody’s hunkered down on the same few planets, digging holes and blasting each others’ brains out? No Man’s Sky is about exploration, so it’s only fitting that it seeks to explore beyond those genre confines. In many ways, No Man’s Sky isn’t an evolution of massive-scale space and survival games. It’s a reaction to them, a critique. It’s not as fully fleshed out as it could be, but it stands alone. It charts new territory. It’s unique and deserves to be appreciated on those merits, especially as it asks us to question the meaning behind the mechanics of other seemingly similar games we play. In some ways, then, No Man’s Sky also serves as a critique of our current envisioning of The Ultimate Video Game. Was that Hello Games’ intention? Who knows. But by simply existing as something markedly different, it forces us to ask questions. Does The Ultimate Video Game have to be about seeking and obtaining power, even in peaceful pursuits (economic dominance, etc)? Does it need to be something we can fully conquer, or would that destroy our sense of awe and undermine the goal of creating a game everyone can play indefinitely? Most importantly, can there even be a singular Ultimate Video Game, given that, especially in the case of No Man’s Sky, everyone’s envisioning of The Ultimate Video Game appears to be slightly different? Does the pursuit of said game water down elements of what could be a more focused, unique experience? Ultimately, though, it’s all a bit paradoxical. As I said earlier, just because a game is big and ambitious, that doesn’t necessarily mean it needs to be The Ultimate Video Game or follow in other sorta-Ultimate Video Games’ footsteps. The most interesting games emerge by defying expectations, not conforming to them. No Man’s Sky isn’t for everybody. I’m fine with that.